The Alister Clark Stakes is a Group 2 race run under the lights at Moonee Valley Racecourse during a stand-alone Friday night meeting during the Melbourne Autumn Racing Carnival in mid-late March each year. It is the sole Group race on the Alister Clark Stakes Night program and is contested over 2040m, the same distance as the coveted Group 1 Ladbrokes Cox Plate during the Spring. Open only to three-year-old horses it is a set weights race offering a total of $200,000 in prize money including $120,000 to the Alister Clark Stakes winner and connections. The race used to be considered a lead-up to the Group 1 Rosehill Guineas (2000m) in Sydney, but a change of scheduling sees the better graduates now head to Royal Randwick during ‘The Championships’ for a shot at the Group 1 ATC Derby (2400m). In 2012 Ethiopia ran second to Highly Recommended in the Alister Clark Stakes before winning the Australian Derby next start as a $14 chance in betting for the Group 1. The 2017 Alister Clark Stakes winner Hardham meanwhile finished third in the ATC Derby trifecta next start. The latest edition of the Alister Clark Stakes takes place on Friday March 15, 2019 . The official Alister Clark Stakes 2019 Results & full finishing order will be announced below when the race is run and won on Friday March 15, 2019 . Alister Clark Stakes odds are usually led by three-year-old colts and geldings boasting good lead-up form over at least a mile (1600m). Previous Melbourne runs and experience at the notoriously tight Moonee Valley circuit are also pluses and affect Alister Clark Stakes betting. Horses coming off a good Autumn Classic run over the 1800m at Caulfield also feature prominently in the markets and the last double figure Alister Clark Stakes winner was Hardham ($12 in 2017). Alister Clark Stakes betting markets open on the Wednesday before the race after final acceptances close and the barriers are released. 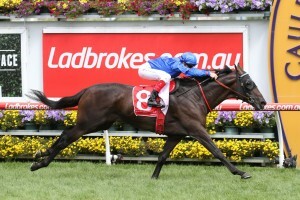 The latest Alister Clark Stakes 2019 odds will be available below as soon as we open betting on the Moonee Valley Group 2 so bookmark this page for access to the markets. Alister Clark Stakes winner Tally (2016) went on to run third in that year’s Australian Derby trifecta in Sydney. Photo Credit: Ultimate Racing Photos. The Alister Clark Stakes field attracts a line-up of promising young staying types. Many are heading towards longer distance features in Sydney and the three-year-olds in the Melbourne Group 2 come via a number of different lead-ups. Horses may come out of earlier autumn features including the Group 2 Autumn Classic (1800m) at Caulfield. In 2015 Chill Party ran eighth in the Autumn Classic before winning the Alister Clark Stakes two runs later. The last horse to complete the Autumn Classic – Alister Clark Stakes double was Tally (2016). Tally also went on to run third in the ATC Derby next start. Another possible lead-up is the Group 1 Australian Guineas (1600m) at Flemington, a race the 2015 Alister Clark Stakes runner-up Stratum Star finished third in. The previous year in 2014 Surge Ahead ran sixth in the Australian Guineas before his Alister Clark Stakes third to Pheidon. More recently, the 2018 Alister Clark Stakes winner Cliff’s Edge improved on a lead-up seventh in the Australian Guineas to win. The Alister Clark Stakes nominations close the Wednesday before the race followed by the final field and barrier draw released on the Wednesday. The official Alister Clark Stakes 2019 field and barriers are due for release on Wednesday March 13, 2019 and will be published in full below so stay tuned. The Alister Clark Stakes 2019 nominations close the Monday leading-up to the Friday night meeting at The Valley and the full list of entries will be available below. Alister Clark Stakes tips include looking for horses with good lead-up form in Melbourne, runners proven over similar distance and those high up the markets. Favourites have a good recent record in the Alister Clark Stakes so laying the favourite is best avoided. The last favourite to salute was Cliff’s Edge ($1.70 in 2018). Another good Alister Clark Stakes betting tip is to back the best finishers in the Autumn Classic that will be suited to the step-up in distance. Our Ladbrokes’ exclusive Alister Clark Stakes 2019 betting tips on the three-year-old stayers to back and sack in the Moonee Valley Group 2 will be detailed below a couple of days out from the race so stay tuned. The Alister Clark Stakes form guide lists all of the crucial information punters need including the jockeys, trainers, barriers and lead-up runs of the horses in the field. The Autumn Classic has been a solid form guide for the Alister Clark Stakes in recent years. When doing the Alister Clark Stakes form it is key to look for the class three-year-old with past Group 1 racing experience and those heading towards a run in the ATC Derby. A link to our comprehensive Alister Clark Stakes 2019 Form Guide will be provided for punters below the week of the race. Single-figure hopefuls and the favourites have dominated the Alister Clark Stakes results in recent years. Notable recent Alister Clark Stakes winners include Cliff’s Edge (2018), Highly Recommended (2012), Linton (2010) and Casino Prince (2007).